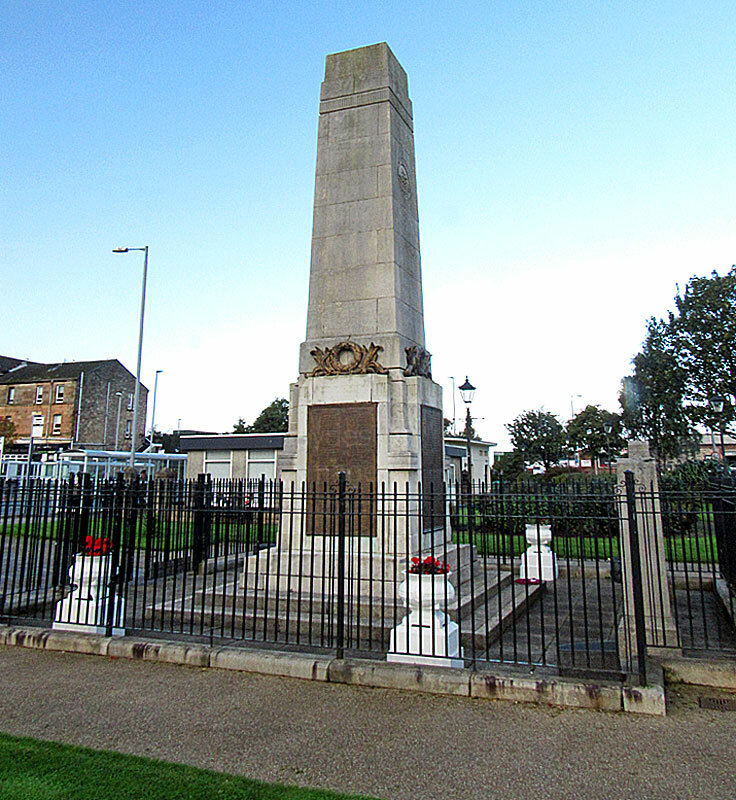 The Greenock War Memorial lies within the town`s Wellpark in Regent Street, on the hillside above Victoria and East India Harbours. 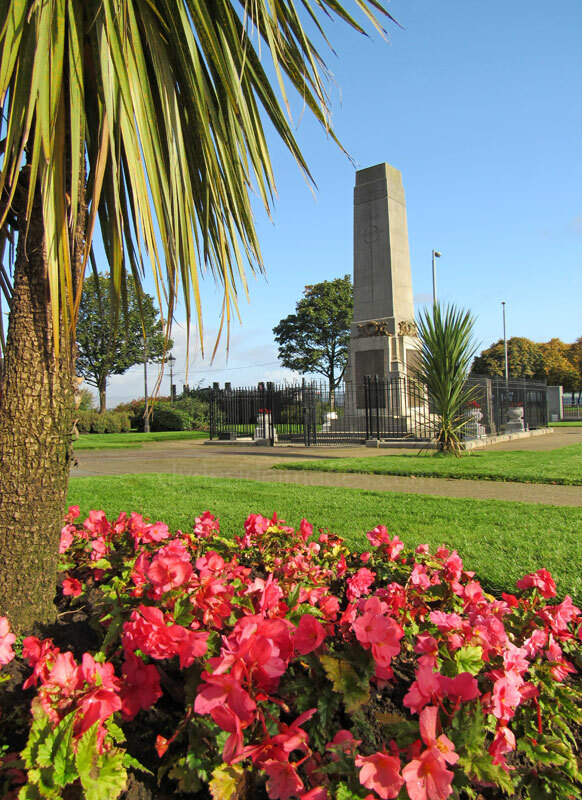 The park was presented to the town in 1851 by Sir Michael Shaw Stewart, a member of parliament and Lord Lieutenant of Renfrewshire. 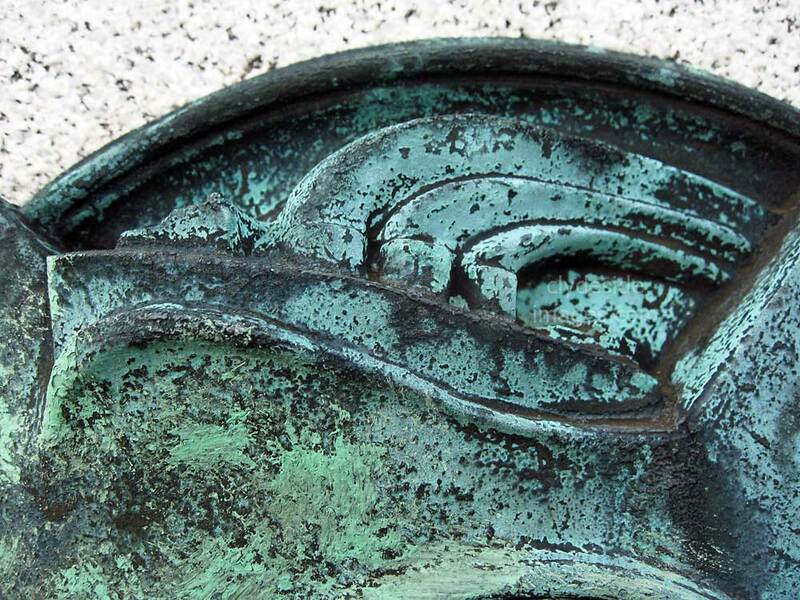 The memorial`s most striking feature is the winged figure of Victory that stands on the prow of a Viking longship with her arm raised, clutching a laurel wreath. 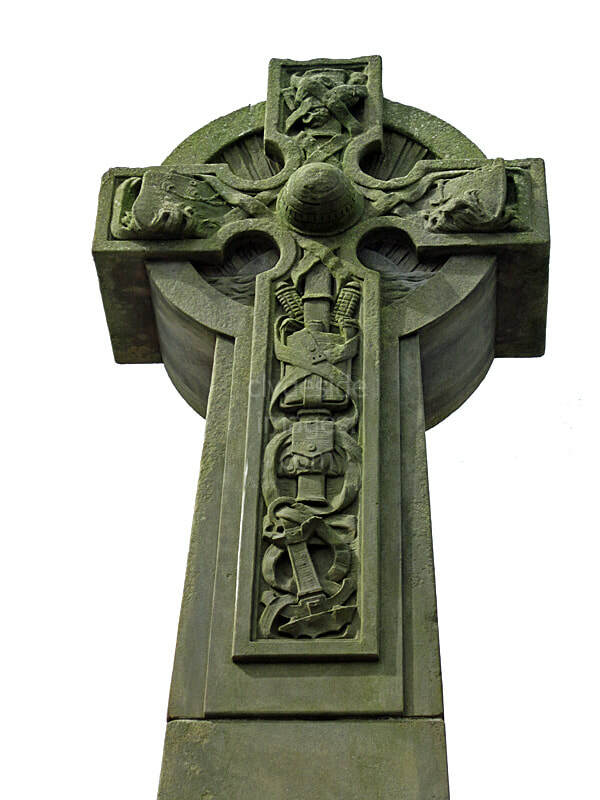 At the top of the obelisk is a Celtic Cross which incorporates a Scottish two-handed Claymore-style longsword. 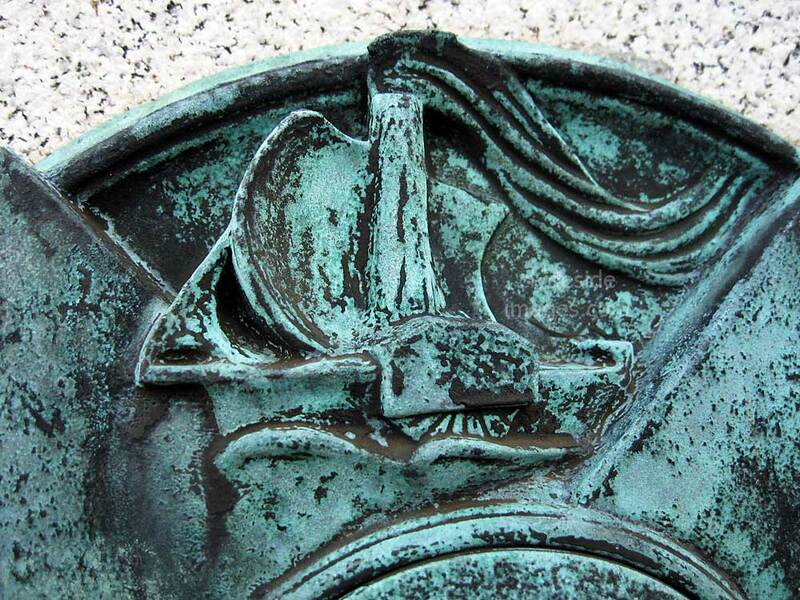 On the cross a fish represents the war at sea, a dog - the land, and an eagle for the air. 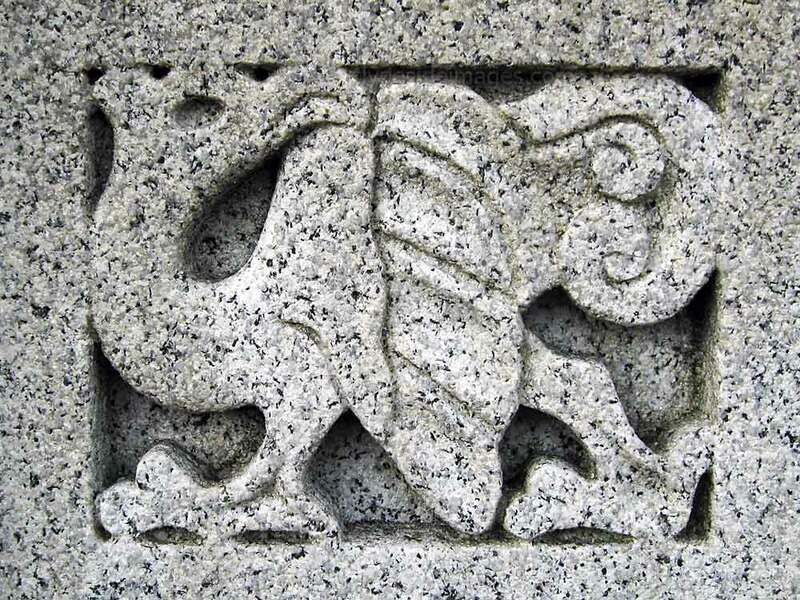 War itself is represented by dragons. 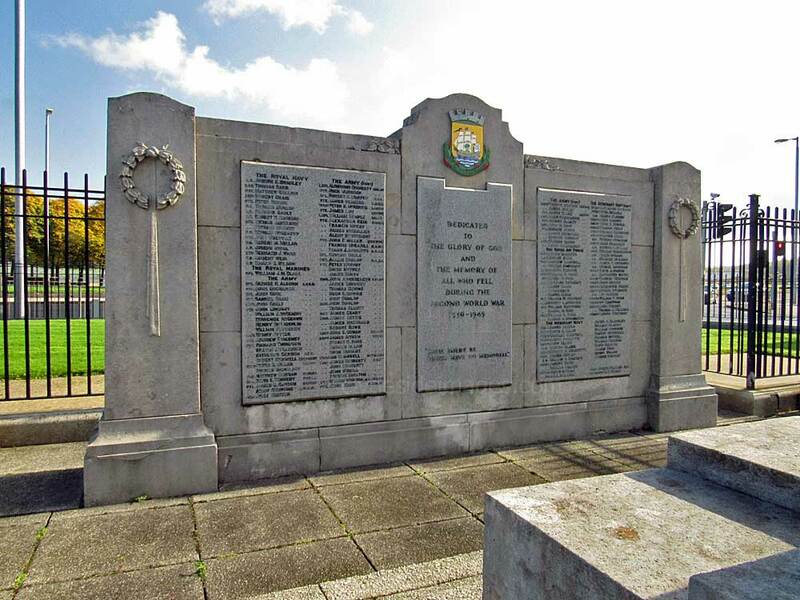 The memorial was unveiled on Saturday 4th October 1924 under bright autumn skies and it is estimated that around 200,000 people attended to witness the ceremony. 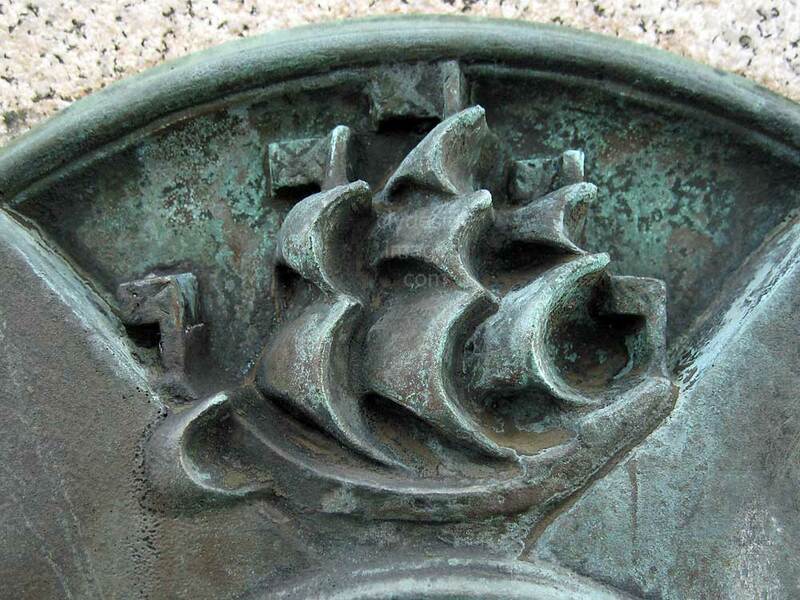 Closer inspection of the memorial reveals a wealth of detail and symbolism and there are many references to the early history of the town and its military and maritime connections. 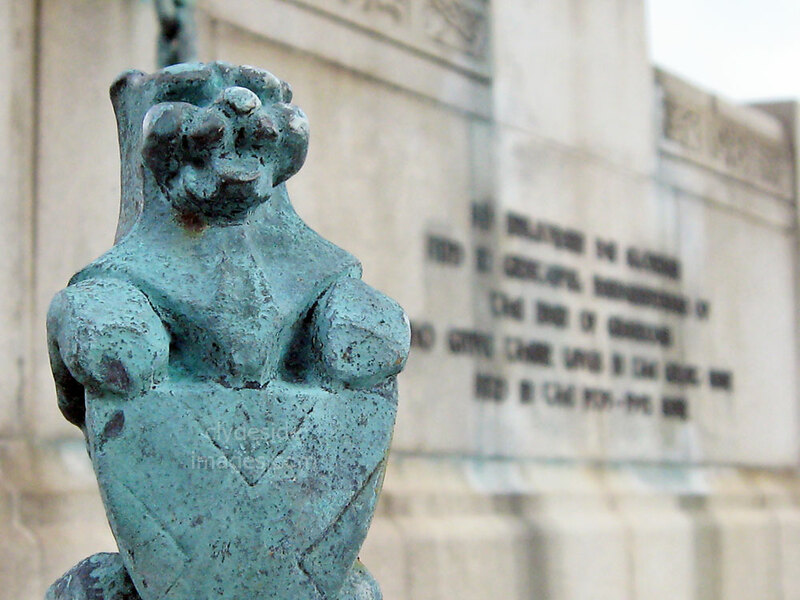 A length of heavy chain at each corner of the memorial is connected to a stone base topped with a Scottish Lion holding a shield adorned with a Saltire. 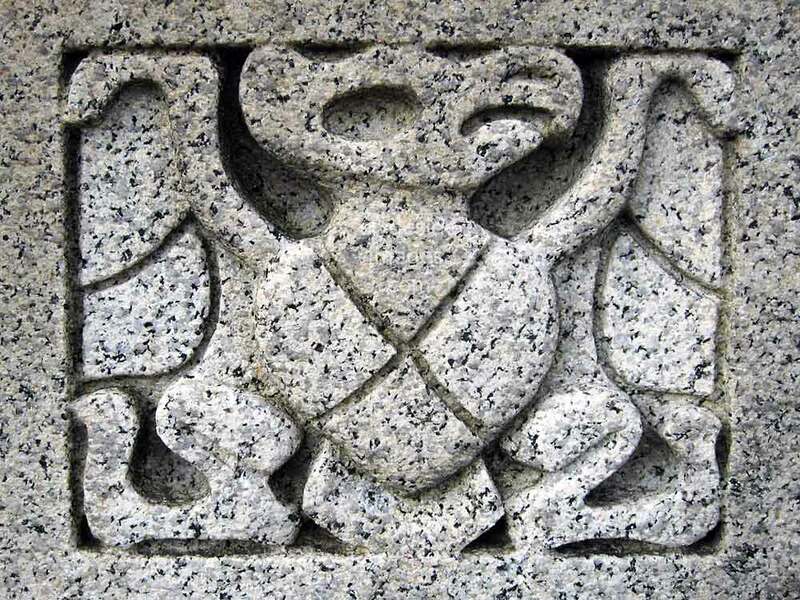 The architect for the project was Messrs. Wright & Wylie and the sculptor was Alexander Proudfoot. Proudfoot was born in Liverpool to Scottish parents and served in the Artists Rifles during the Great War. When hostilities ended he became head of sculpture at Glasgow School of Art. 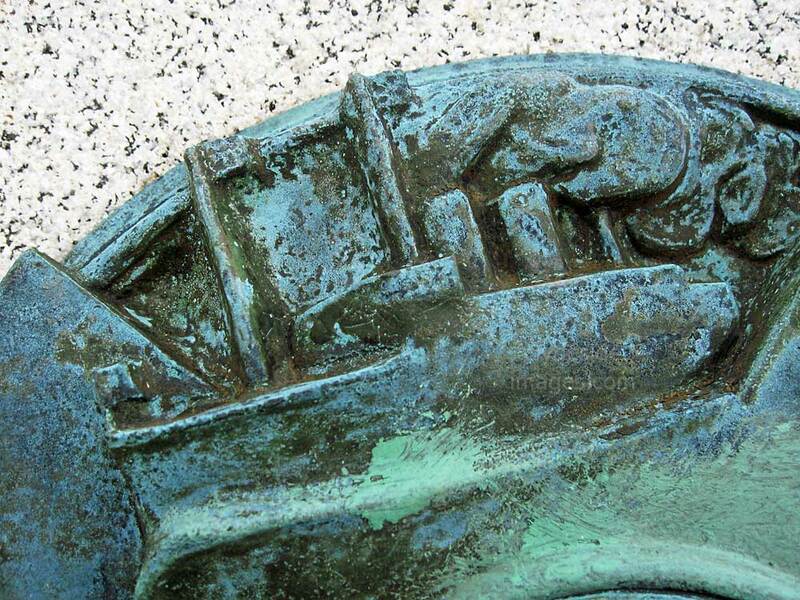 The bronze circular fixings that connect the lengths of chain at the obelisk end all feature small ships. 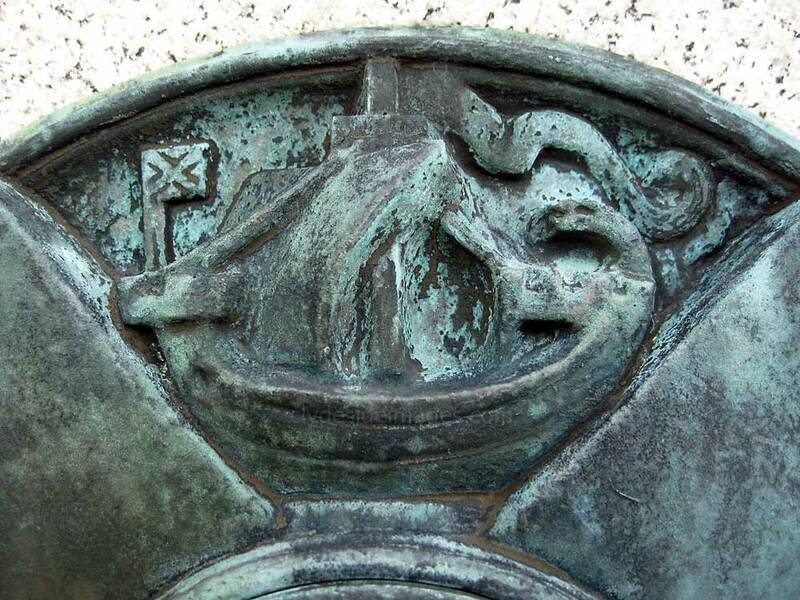 Sailing ships are represented are as are more modern vessels. 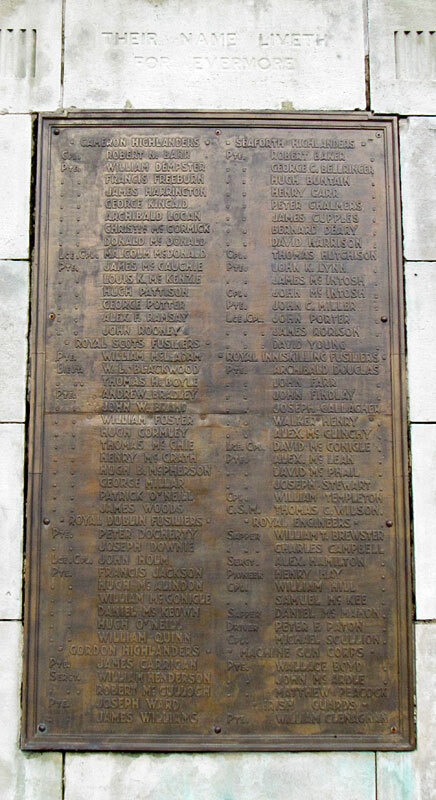 Around the base are panels each naming an arena of battle during the Great War. 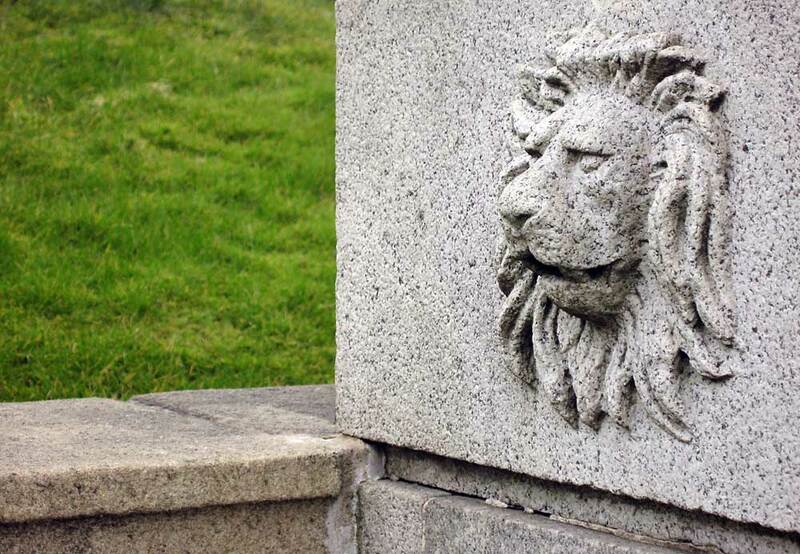 This one, for the campaign in Flanders, has the Flanders Lion on each side. 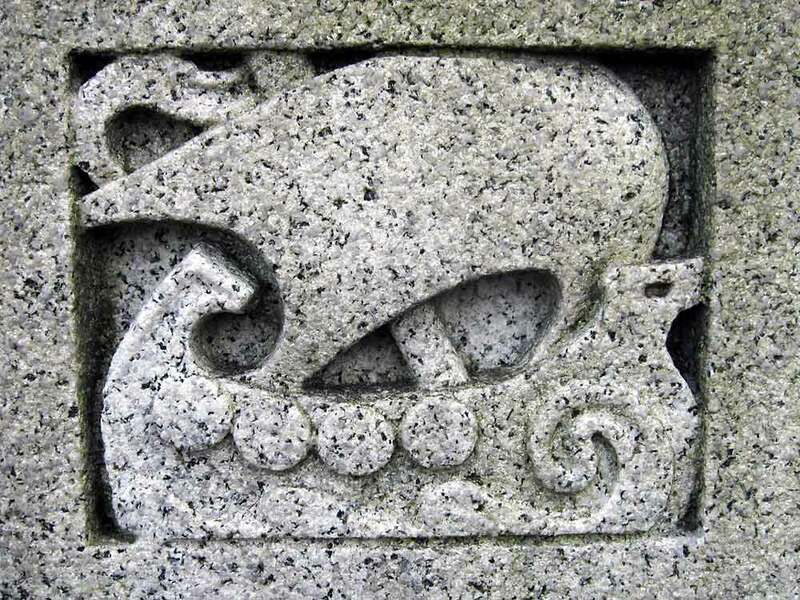 The Battle of Jutland is represented by a Danish Raven and a Dolphin (for the North Sea). 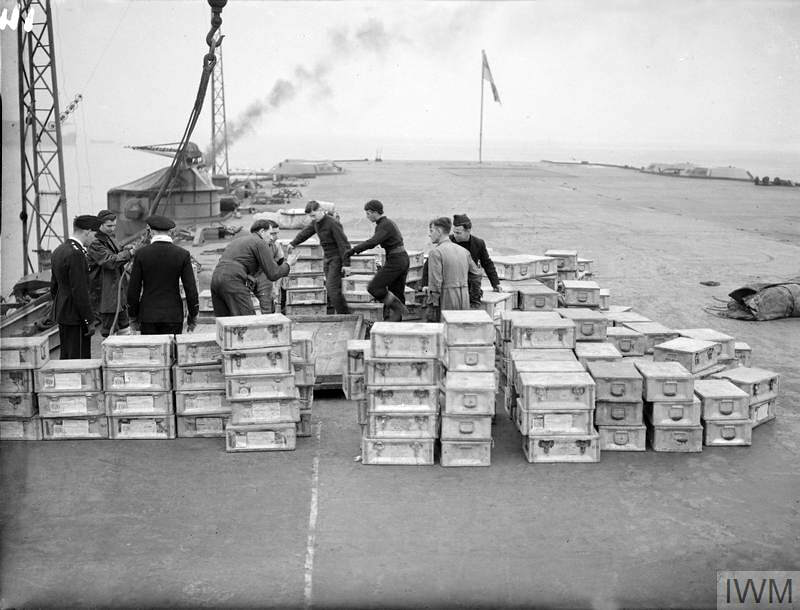 Another sea battle, this time The Falklands, features a Sheep (below left). 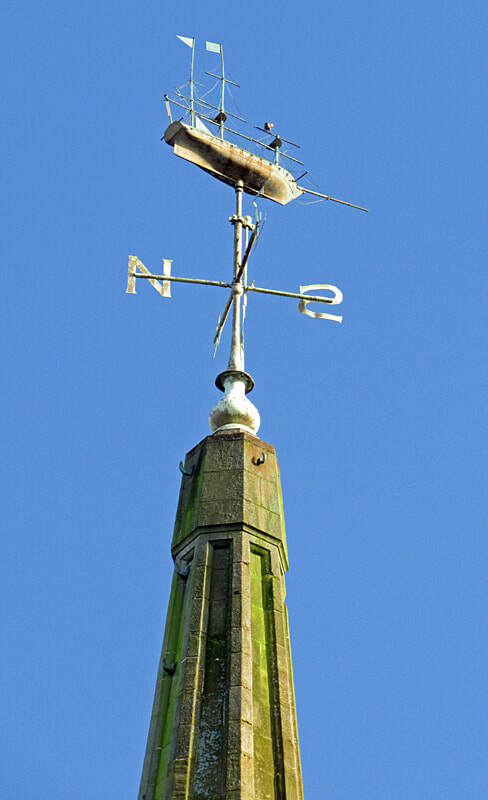 The ship below represents Zeebrugge. 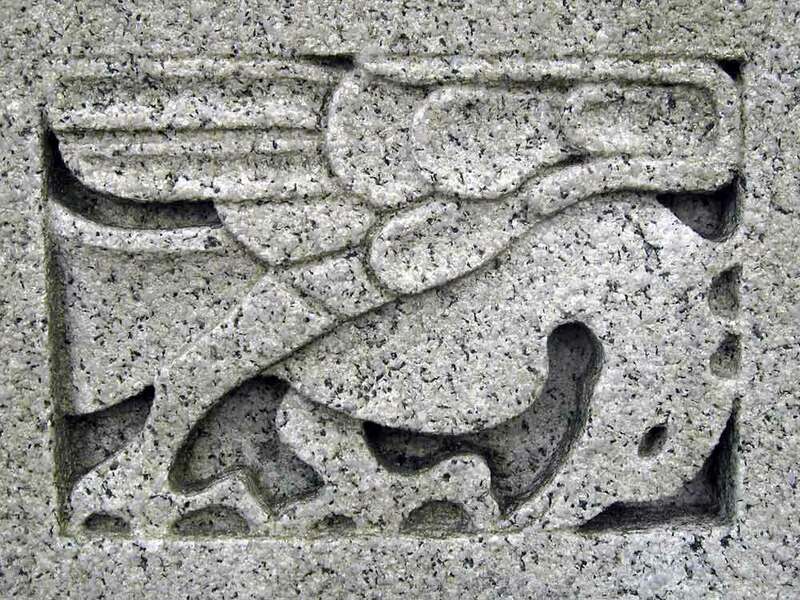 The campaign in France is represented by a Cockerel while the campaign in Italy features an Eagle. 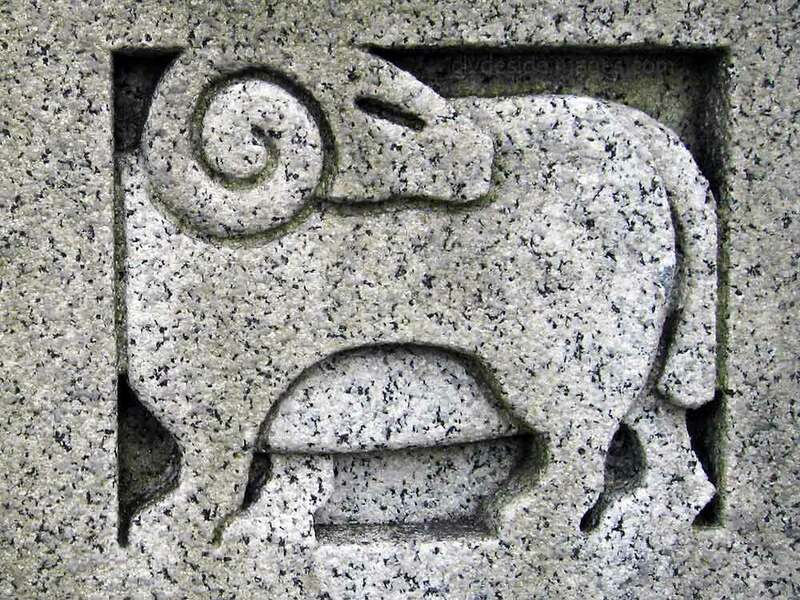 The Mesopotamia panel is flanked by Nerjal, a Babylonian War God, (below left) and Nin the Fish God (above). 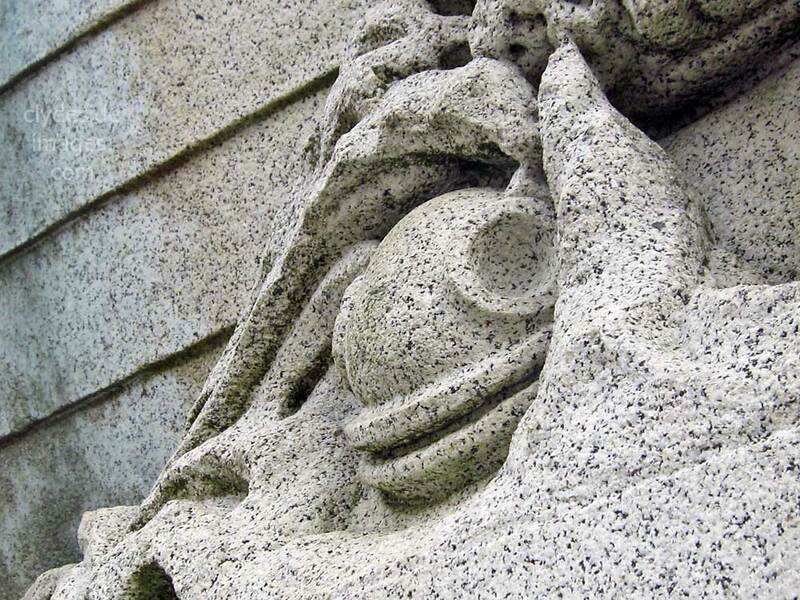 Many other subjects are carved into the stonework of what is a striking memorial. 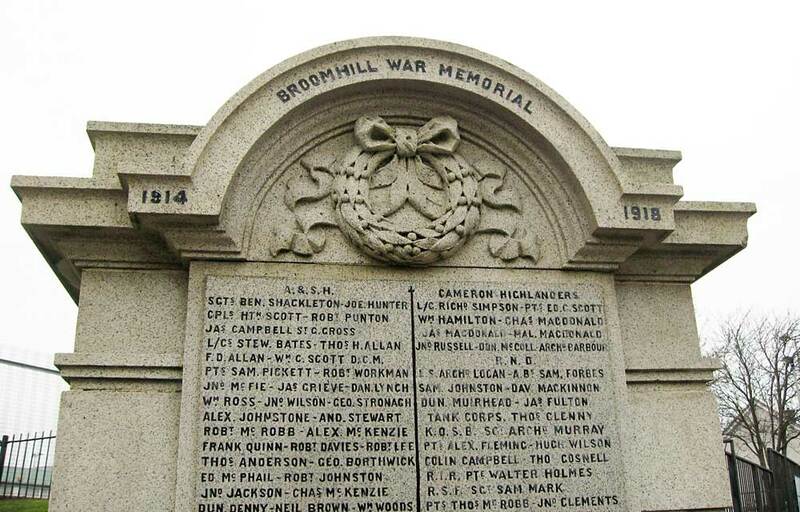 An inscription was later added to commemorate those who fell during the Second World War. 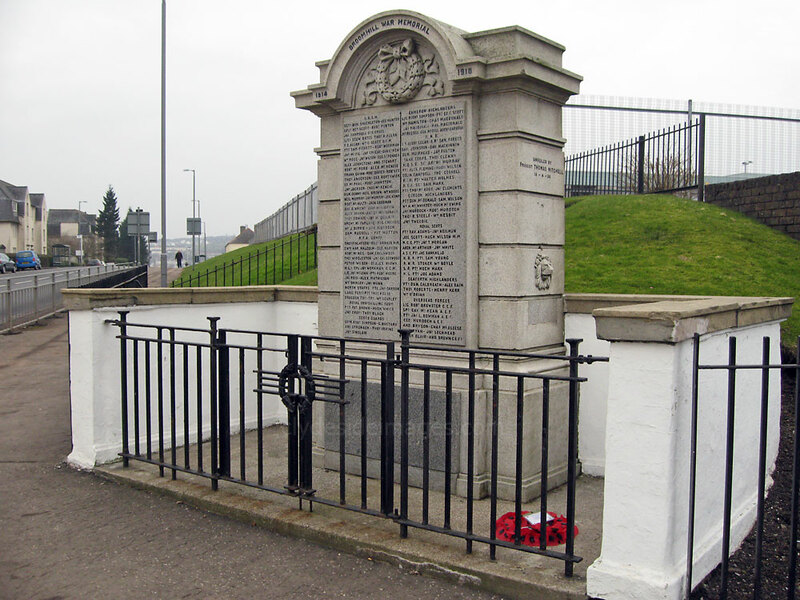 The Free French Memorial stands near the summit of Lyle Hill, a tremendous viewpoint that overlooks Gourock and the Tail of the Bank` anchorage which is the point where the river becomes the Firth of Clyde. During the First and Second World Wars Greenock and Gourock saw a massive influx of soldiers and sailors from all of the Allied Nations and convoys and their escorts would assemble or arrive at the anchorage which was protected by an anti-submarine boom that stretched from the Cloch Lighthouse to Dunoon. The memorial comprises of a white Cross of Lorraine with the bottom section forming the flukes of an anchor which rests on a stone base bearing a number of plaques in English and French. It is dedicated to the memory of the Free French Naval Forces, many of whom sailed from Greenock, and lost their lives in the Battle of the Atlantic between 1940 - 1945. 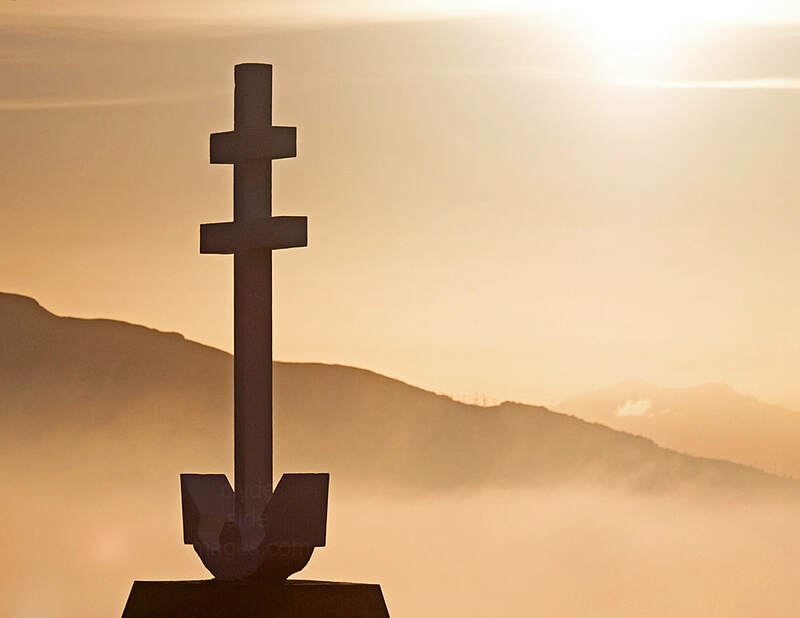 After the Fall of France in 1940 the Cross of Lorraine was adopted as the symbol of the Free French Forces who continued the fight against Nazi Germany from Great Britain and elsewhere. 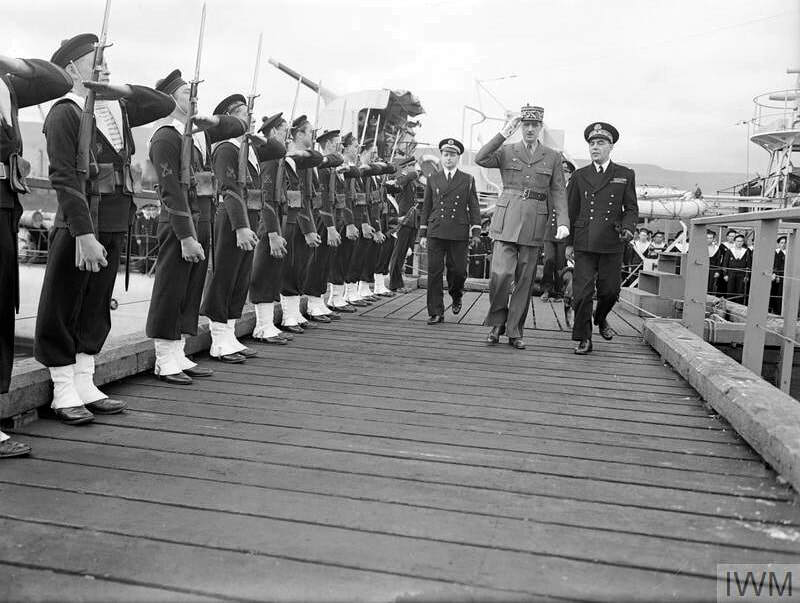 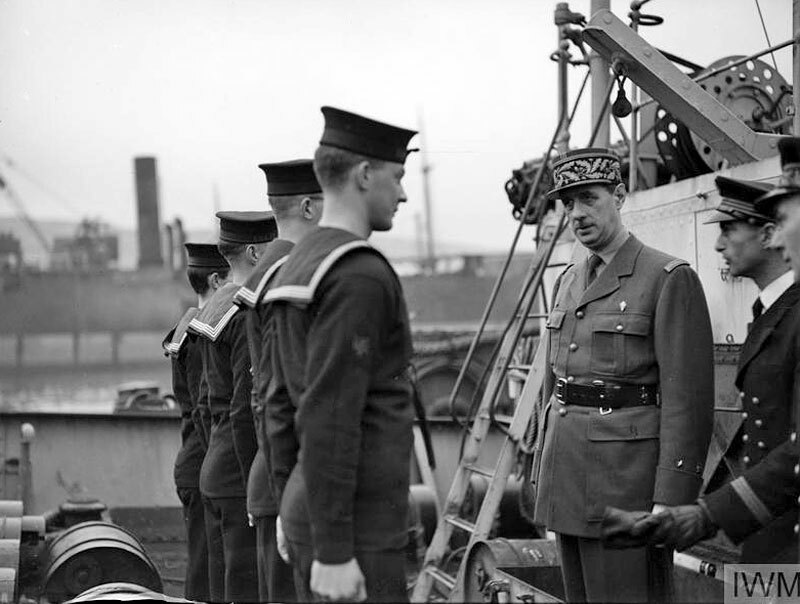 They were led by General Charles de Gaulle who paid a visit to the French Naval Base at Greenock on Christmas Day, 1941. 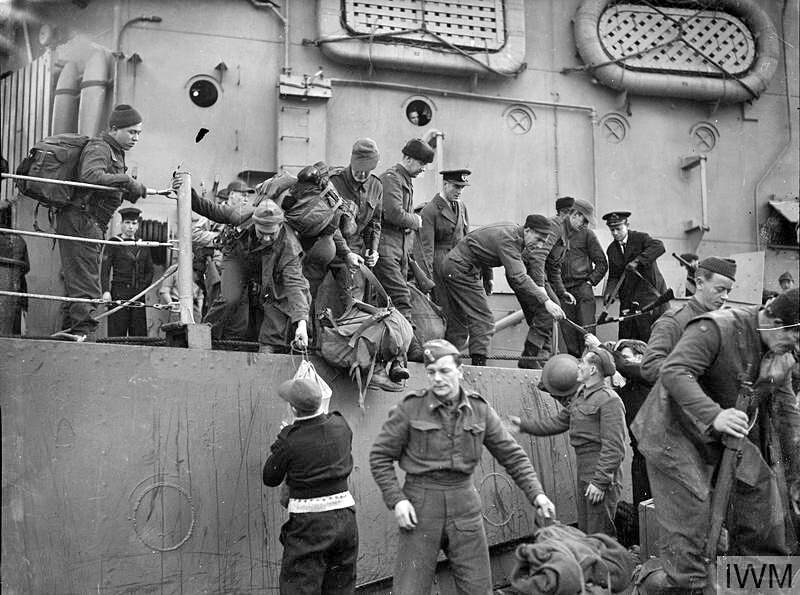 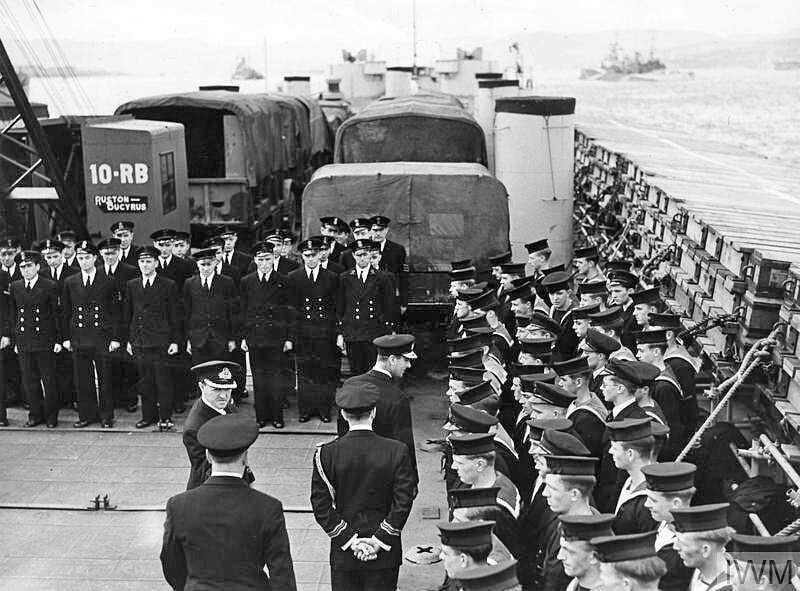 The General was back in December 1942 to present medals to the men of FS Roselys which rammed a U-Boat. 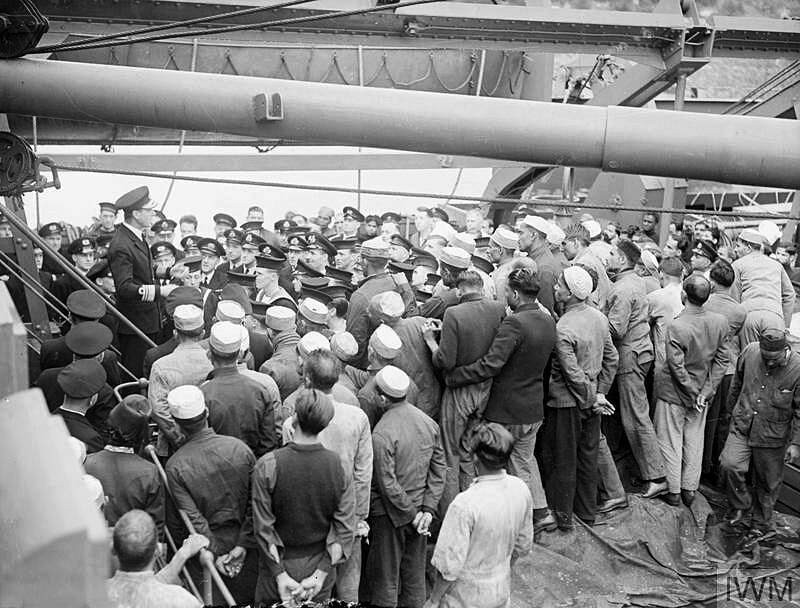 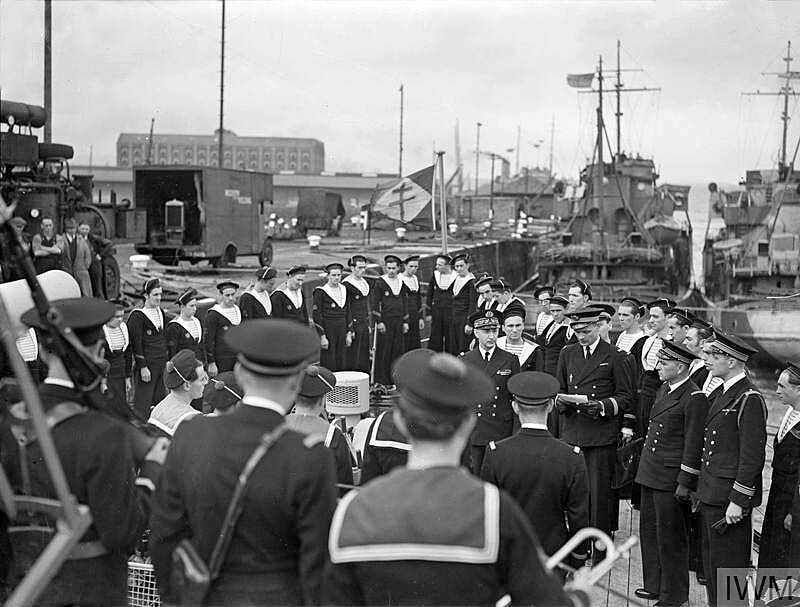 ​The shot below shows Rear Admiral Thierry D'Argenlieu addressing the ship's company of the Free French Navy corvette Renoncule while moored at Greenock. 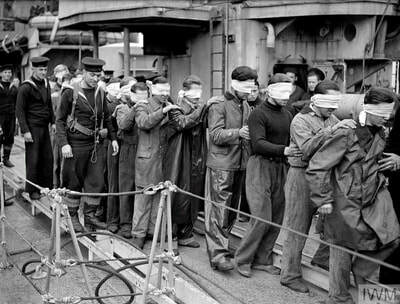 It was not just the hazardous North Atlantic convoys and patrols that took their toll of French seamen. On 30 April 1940, following participation in the Battle for Norway, the French destroyer Maille-Breze was at Greenock for a refit and essential maintenance. 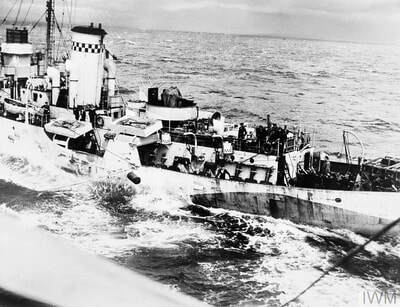 Her crew were shifting torpedoes when one accidentally exploded causing the vessel to swiftly sink. 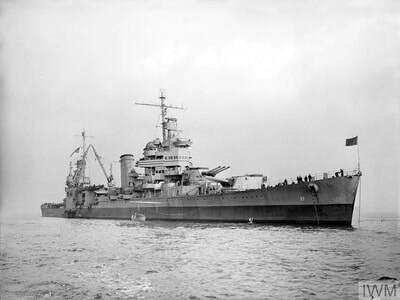 Twenty-eight of her crew were killed and seven of those recovered were buried in Greenock Cemetery. 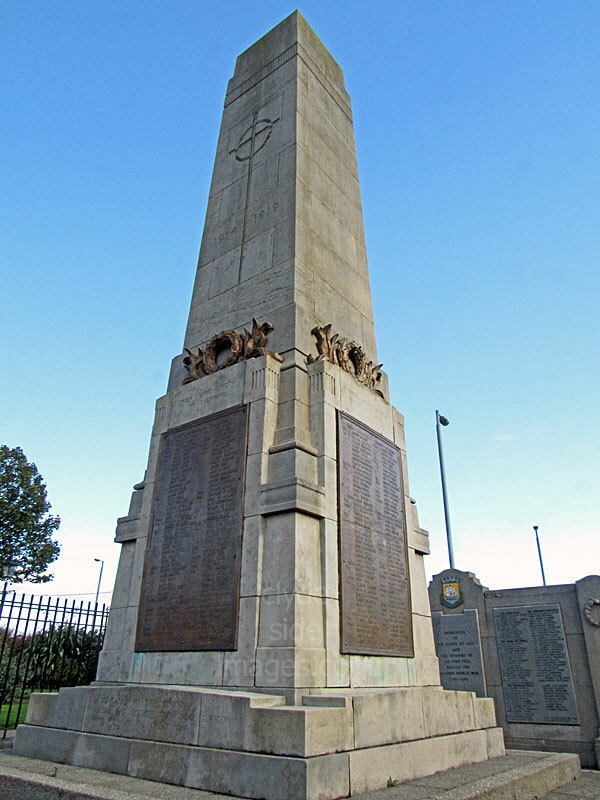 ​When hostilities ended the officers and men of the Free French Naval Base designed and erected the monument, the cost of which was met by donations from personnel serving in the Free French Forces throughout the world. 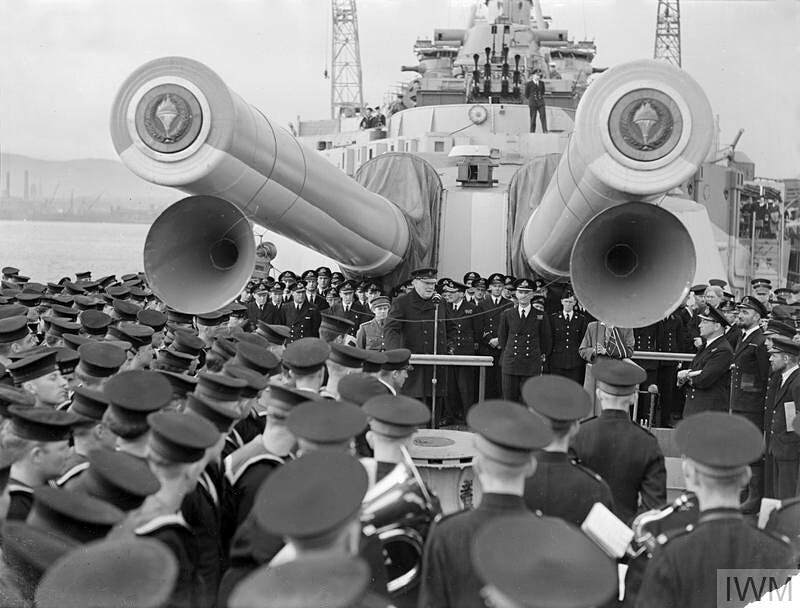 Right: ​This image, taken on 20 September 1943, shows Winston Churchill on the deck of HMS Renown addressing the 23,000 ton Battle-Cruiser`s company while the warship was anchored off Greenock . 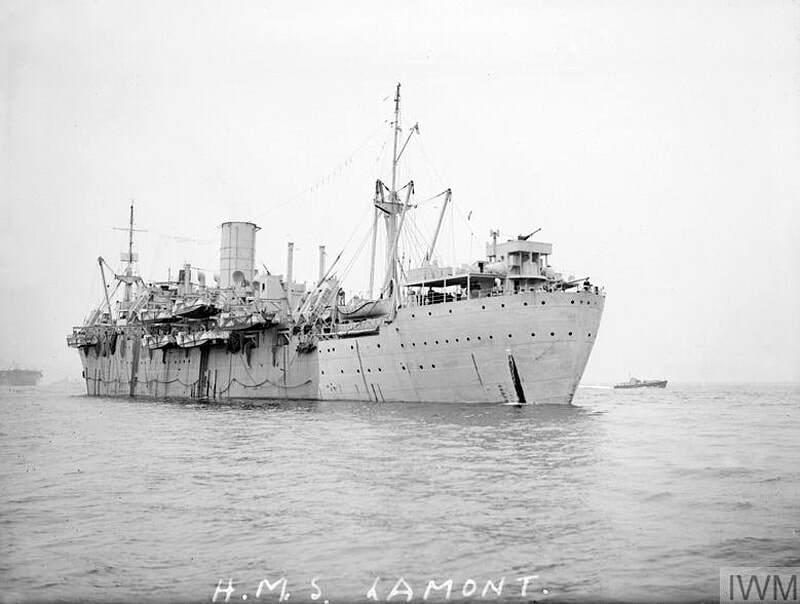 The vessel had just brought the Prime Minister back to Great Britain after a long stay in Canada and the U.S.
Signal City was the nickname given to the Royal Navy signal station at Greenock which was the busiest naval communication station outside the Admiralty in London. 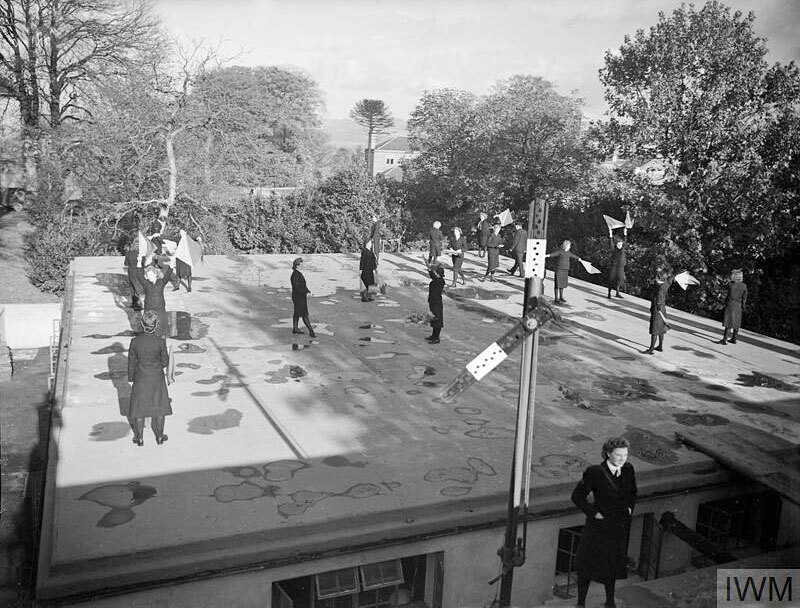 Contained in an old house on the outskirts of the town, each room had several doors for easy interdepartmental access and a flat roof, known as the `Flag Deck` for training Wrens in visual signalling. Around 200 Wrens worked at the facility under the supervision of the signal commander, and a few naval signalmen. 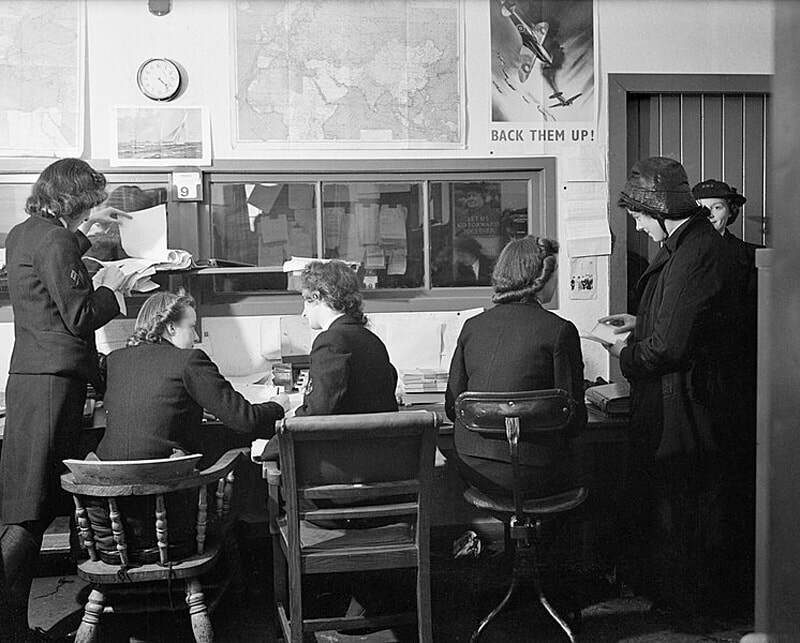 Wireless telephonists, cypher officers, teleprinter operators and dispatch riders, handled hundreds of vital messages each day, from and to ships at sea, naval bases and posts all over the British Isles. 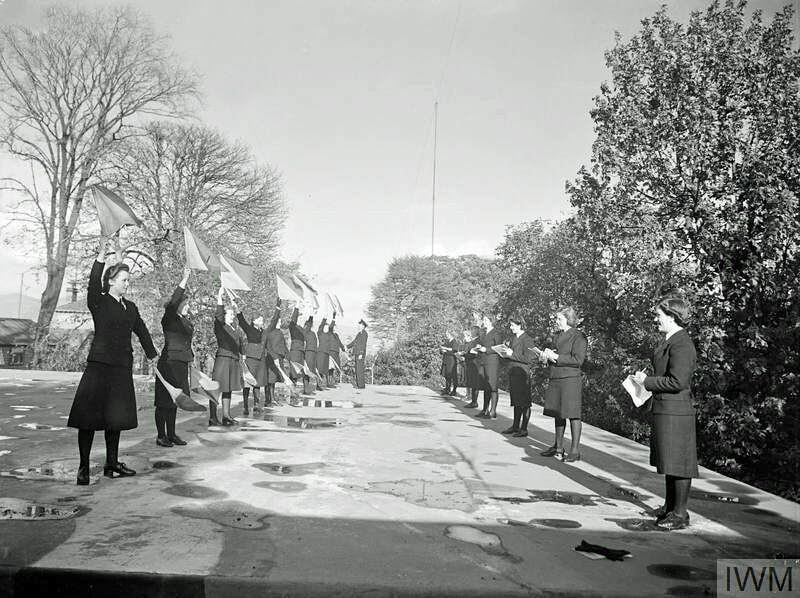 Most of these messages were in code and coding and decoding was handled exclusively by a core of thirty-five Wren officers, who regularly dealt with 3,000 confidential signals each week. 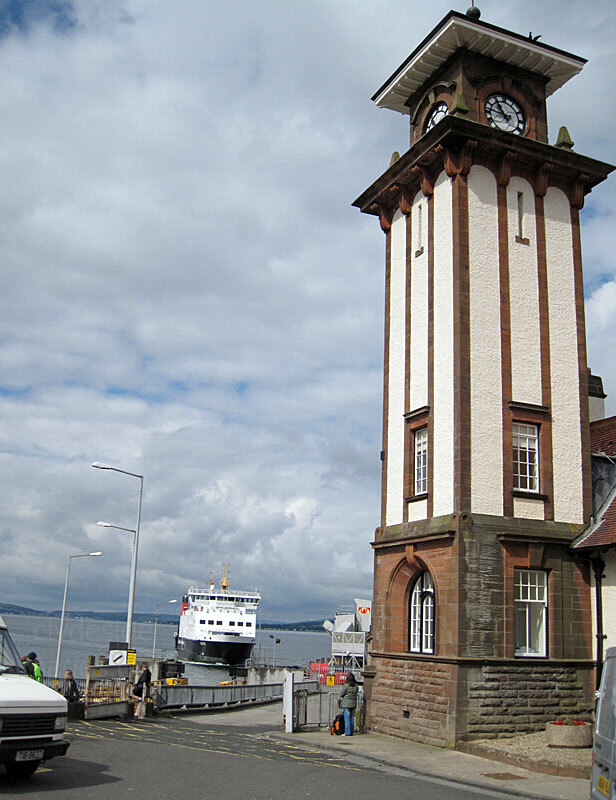 Port Glasgow is the second largest town in the Inverclyde area of Scotland and lies immediately east of, and merges with its larger neighbour Greenock. 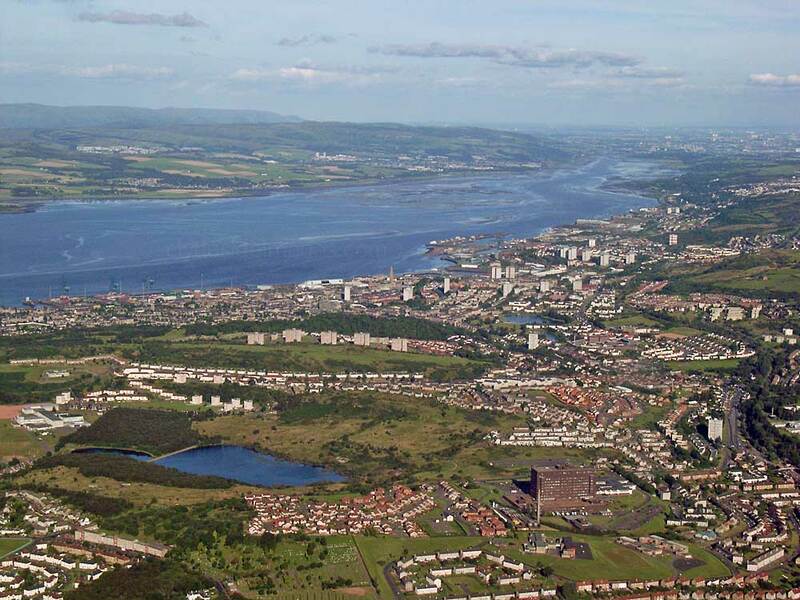 Port Glasgow was originally named Newark and was established as a port for nearby Glasgow in 1668 as the wide, but very shallow River Clyde made it difficult for merchant vessels to reach the city`s docks. 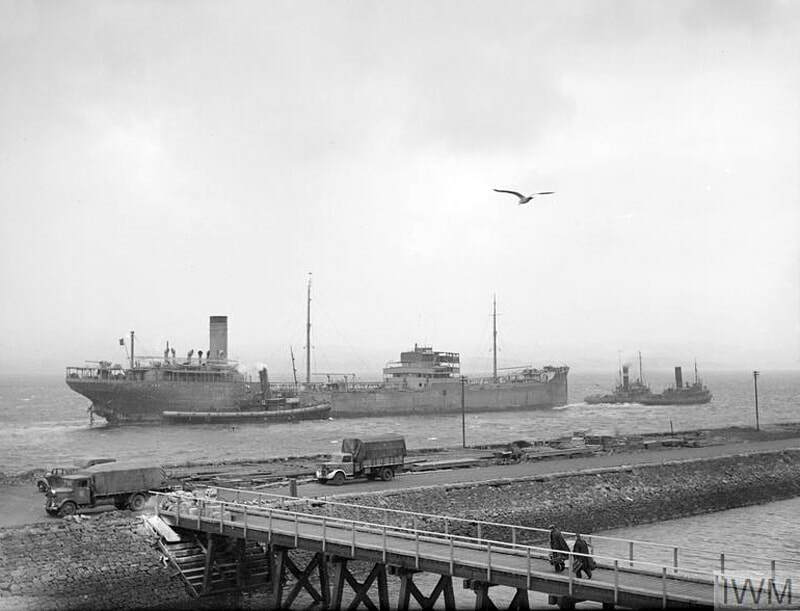 As a result, cargoes were offloaded at Newark which became Port Glasgow in 1775. 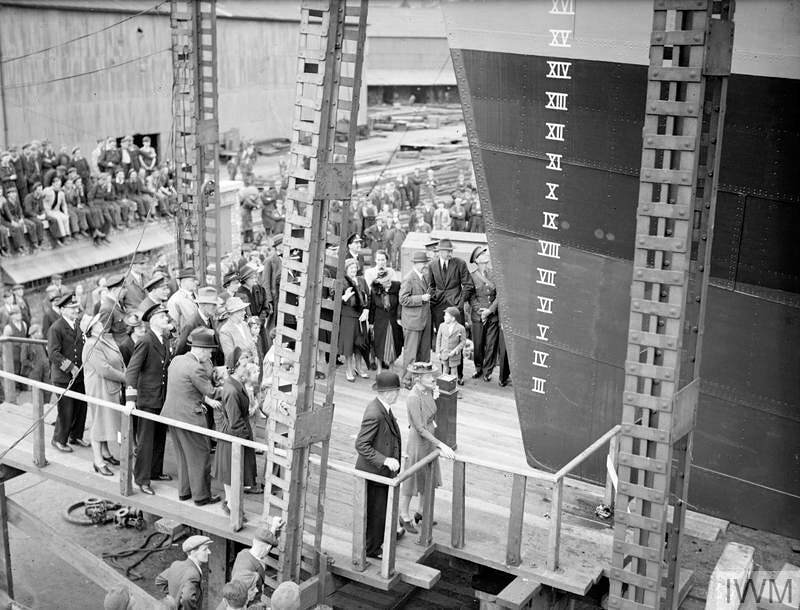 The town grew to become a major player in the shipbuilding industry ever since Thomas McGill established a yard here in 1780. 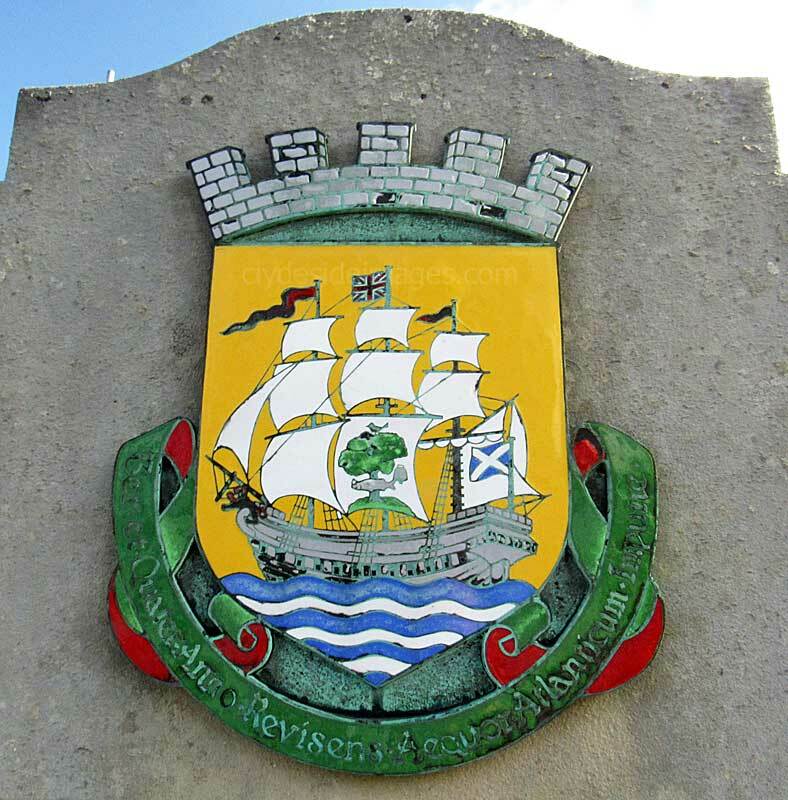 Piers and breakwaters enclosing the harbour were constructed and trade soon prospered. 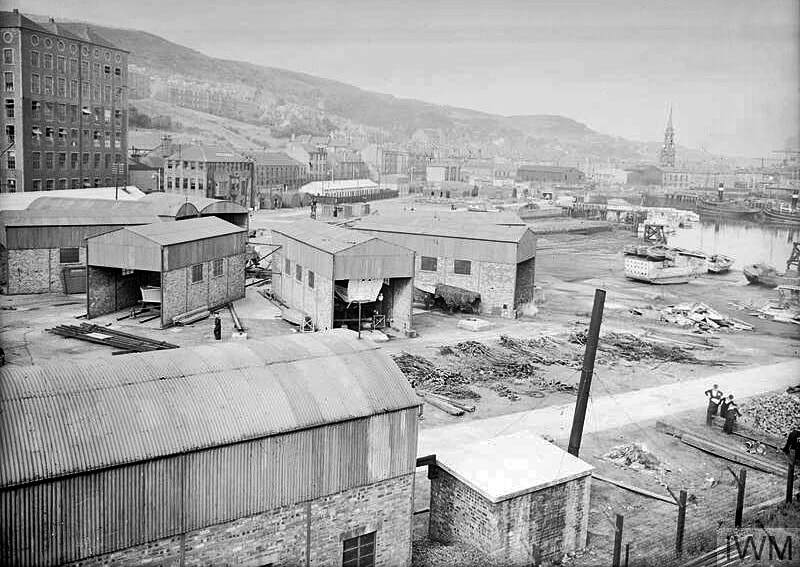 In 1903, Port Glasgow`s most famous shipbuilding company, now known as Ferguson Marine Engineering Ltd , was founded by the four Ferguson Brothers, Peter, Daniel, Louis and Robert, who left a shipyard in Paisley to lease the Newark yard in the Port. They soon acquired the freehold for the Newark site but in 1918, the Company was purchased by John Slater Ltd. (Amalgamated Industries). 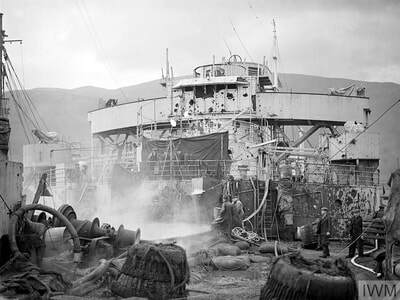 ​The Ferguson family regained control in the 1920s and remained the sole operator until Lithgows Ltd. purchased an interest in the business in 1955. 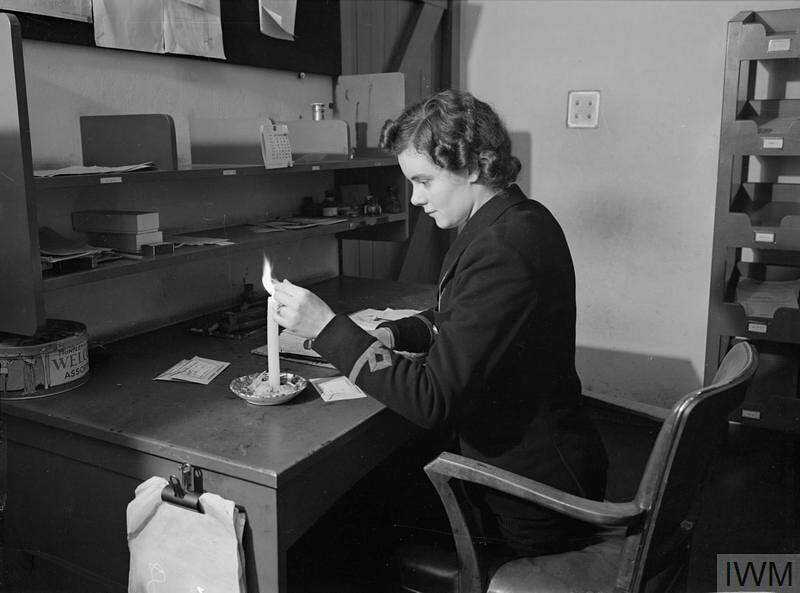 Lithgows took control of the Company in 1961 which. 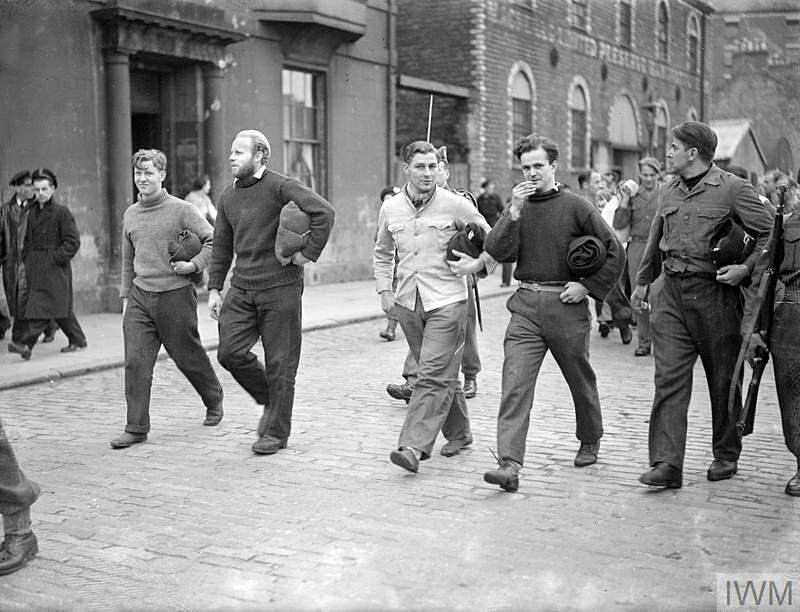 remained a separate entity within the Scott Lithgow group from 1969 to 1977. 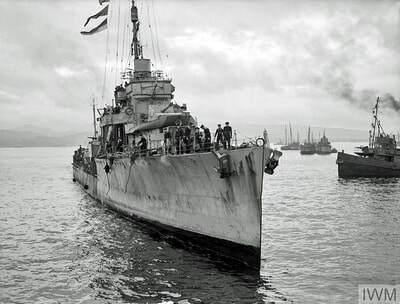 ​During the Second World War, the Port Glasgow yard was designated HMS Monck for a period of time. This title refers to a Clyde-based Royal Navy shore base, commissioned from 1/4/42 to 30/9/46, which has a rather confusing history because of changes in its location and function. As well as Port Glasgow, Clyde bases located at Largs and Roseneath became HMS Monck for a time. The above view from the Imperial War Museum archives shows the Port Glasgow site during WW2. 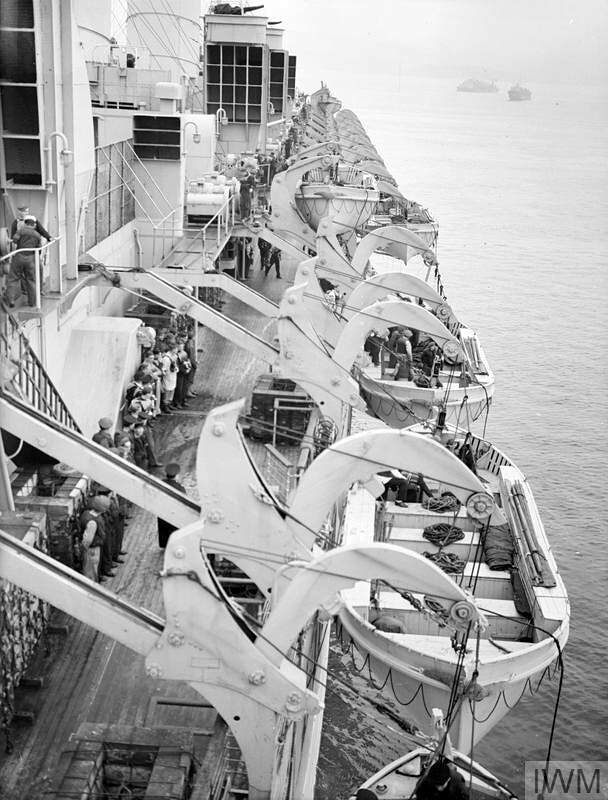 It was used primarily for the construction, assembly and repair of troop landing craft with the vessels often double stacked in a long row down the centre of the quay. 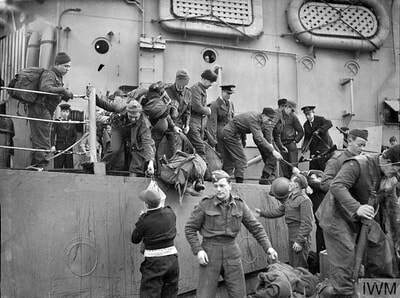 The shore billets for the base were located south east of the town on the high ground known locally as High Carnegie. 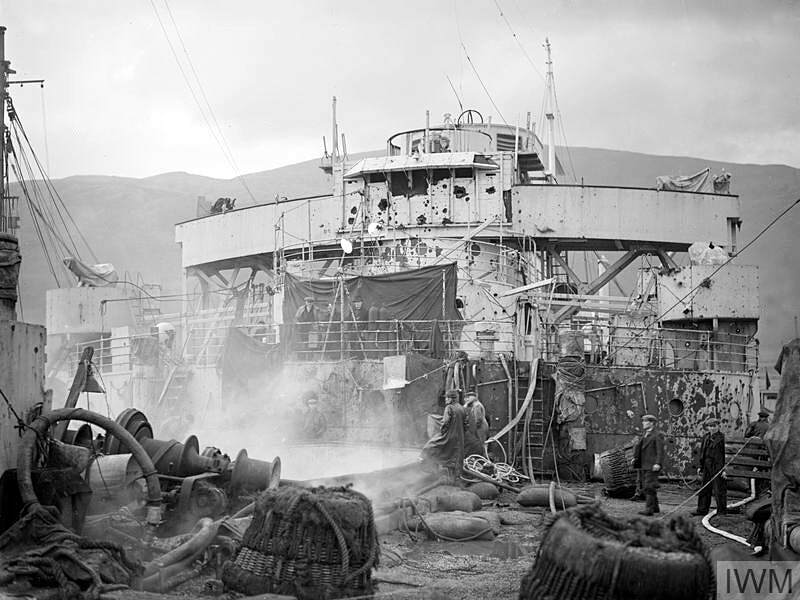 The Scott Lithgow group was nationalised as part of British Shipbuilders in 1977 and following a succession of mergers and acquisitions it was sold by Kvaerner to Ferguson Marine plc in 1991. 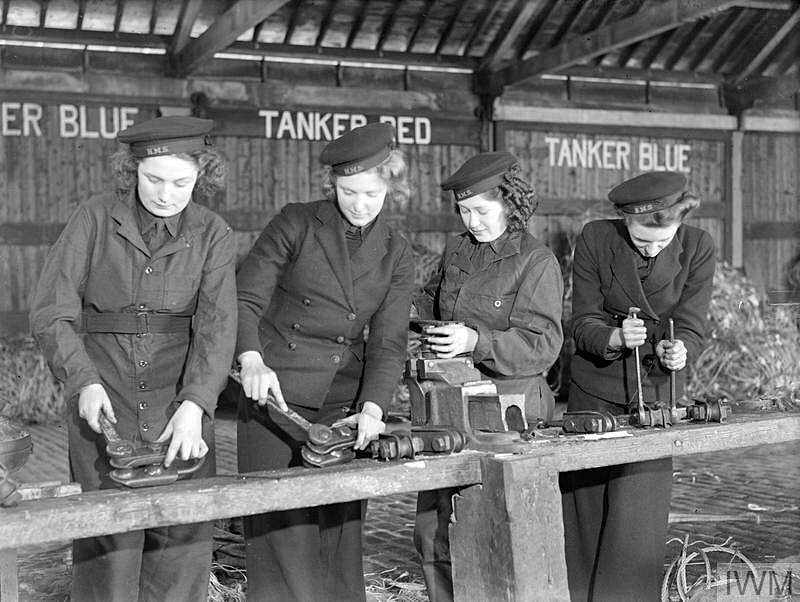 Further changes of ownership followed and a sparse order book meant the threat of closure and redundancies for the workforce was never too far off. 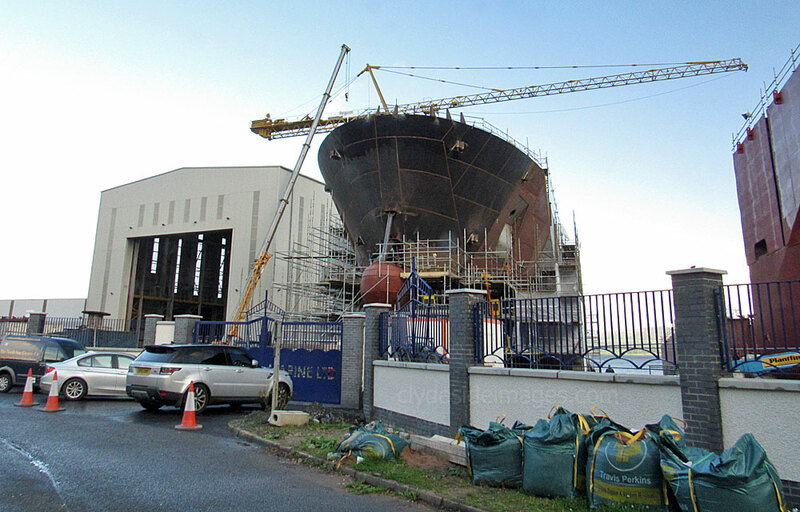 On Friday, 15 August 2014, the shipyard went into administration, but less than one month later, Clyde Blowers Capital, an industrial company owned by entrepreneur Jim McColl, purchase the yard for £600,000. The Port Glasgow yard is now the only builder of merchant ships on the river. 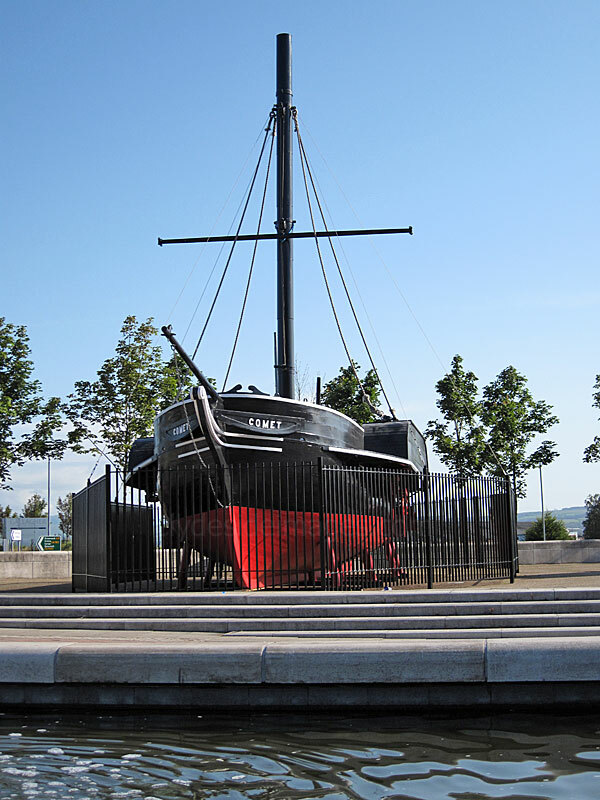 Henry Bell (7 April 1767 – 14 March 1830) was a celebrated character on Clydeside who pioneered the development of nautical steam power and his vessel, Comet, built at Port Glasgow, operated the first steamboat service on the Clyde in 1812. 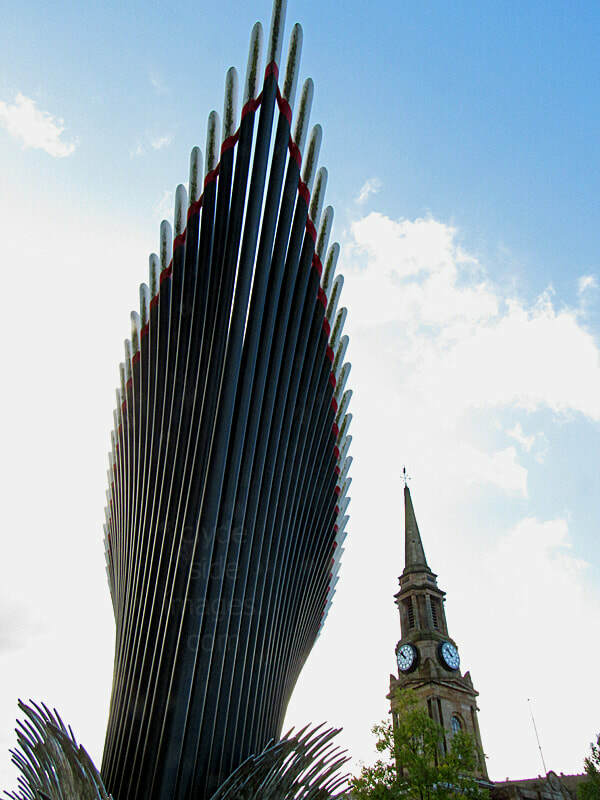 ​This fine replica stands in the town, close to the waterfront. 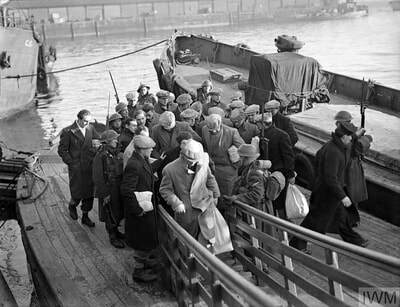 Initially the paddle-steamer transported passengers between Glasgow, Greenock and Bell`s hotel in Helensburgh, sailing three times a week. 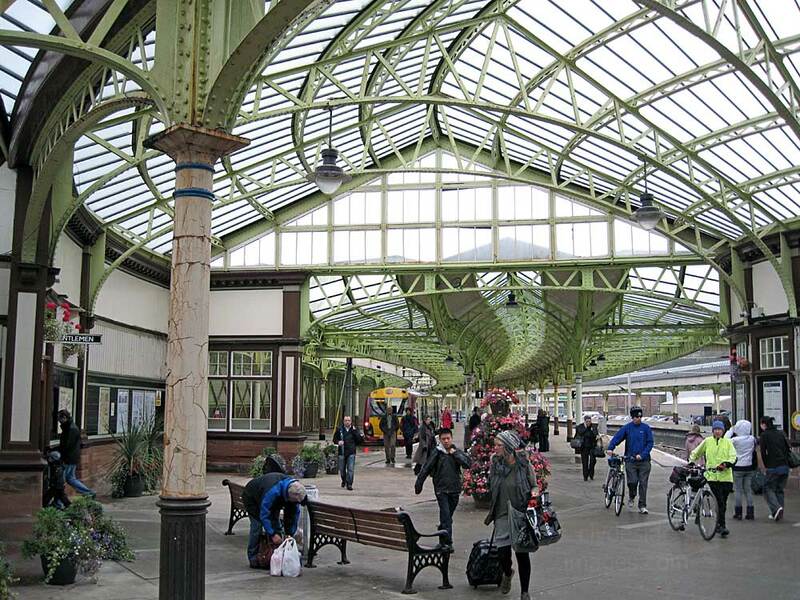 The coastal village of Wemyss Bay in Inverclyde lies within in the traditional county of Renfrewshire, adjacent to Skelmorlie, which lies in the bordering county of North Ayrshire. 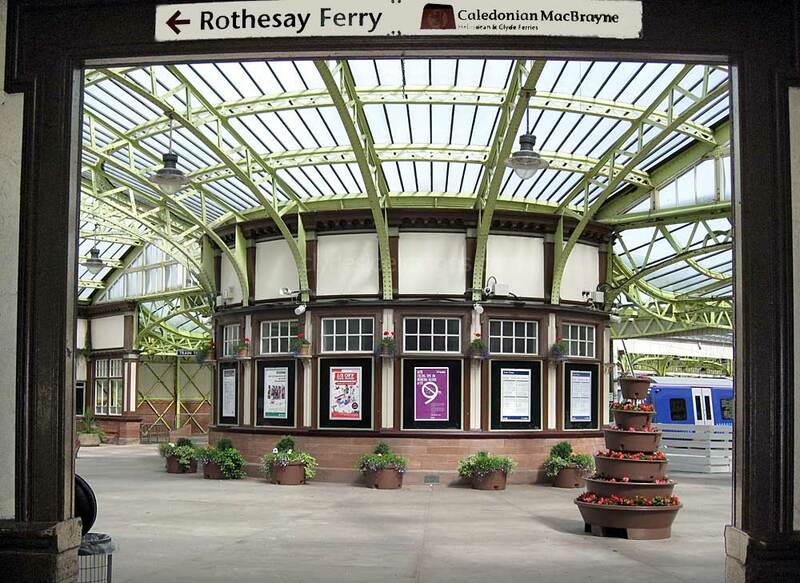 Wemyss Bay is the ferry port to Rothesay on the Isle of Bute and the route is served by regular rail connections from Glasgow which terminate at the village`s architecturally outstanding railway station which incorporates the Caledonian MacBrayne ferry terminal. 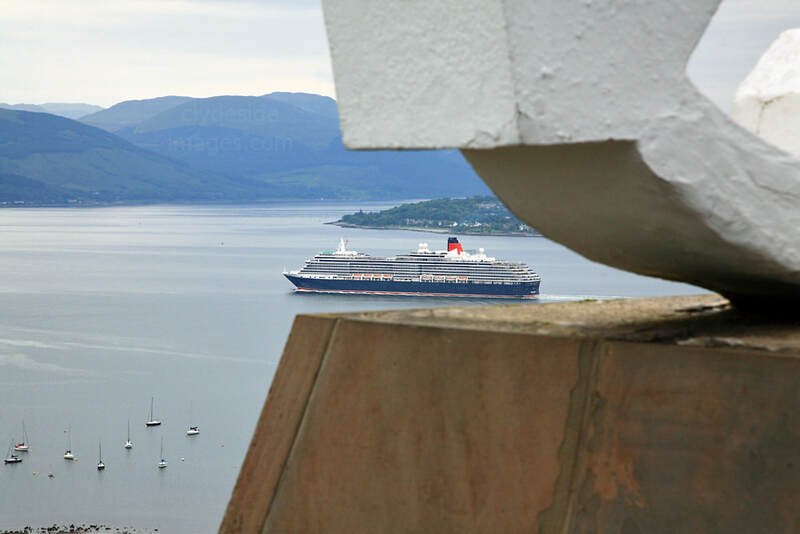 The mainland coast port is very exposed, so in high winds the ferries must travel up river to Gourock to dock. 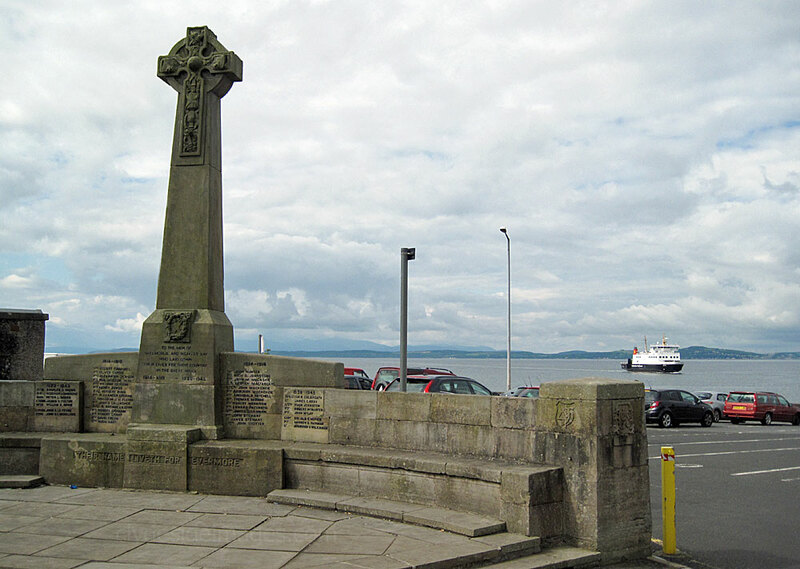 ​The war memorial here stands at the Pierhead (Shore Road) and commemorates the military personnel from Skelmorlie and Wemyss Bay who gave their lives in both World Wars. 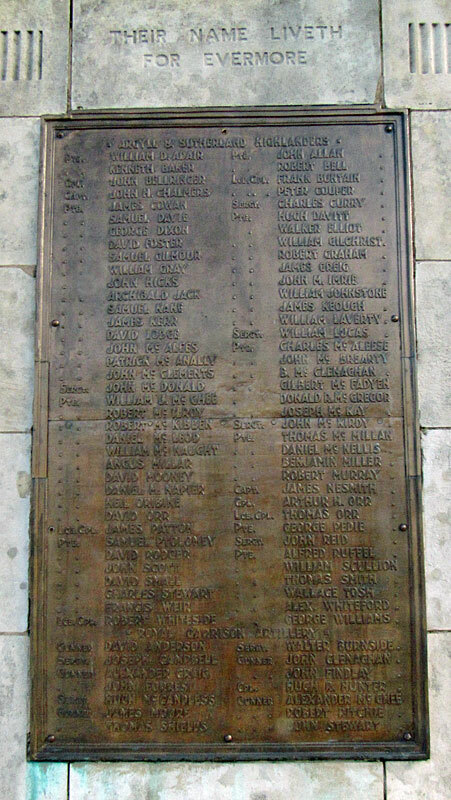 There are 29 names listed from the Great War and 15 from World War II. 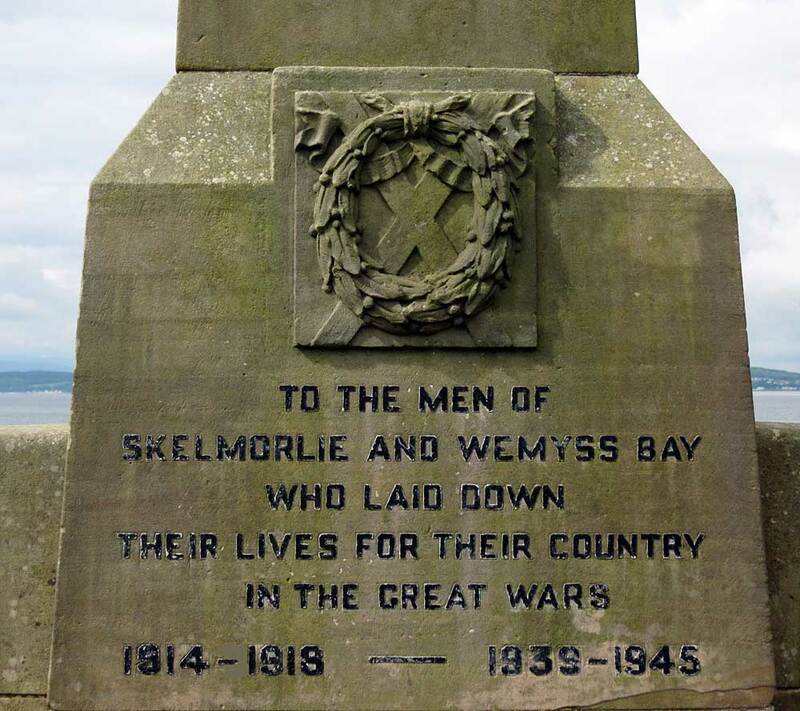 The inscription reads "To the men of Skelmorlie and Wemyss Bay who laid down their lives for their country in the Great Wars 1914-1918 -- 1939-1945". 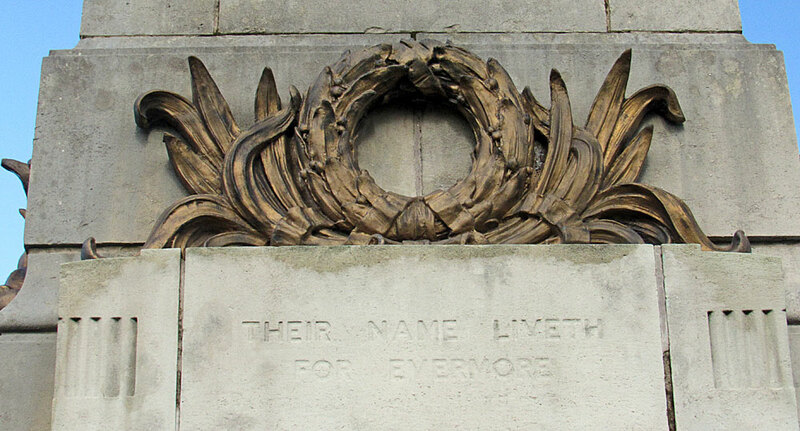 "Their name liveth for evermore". 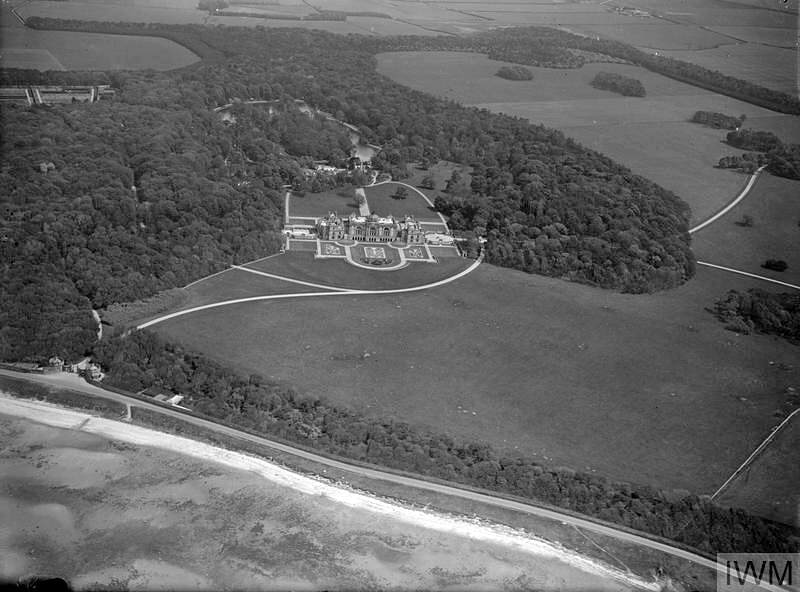 Castle Wemyss (left) was a large mansion which stood on the eastern shore of the Firth of Clyde at Wemyss Point. 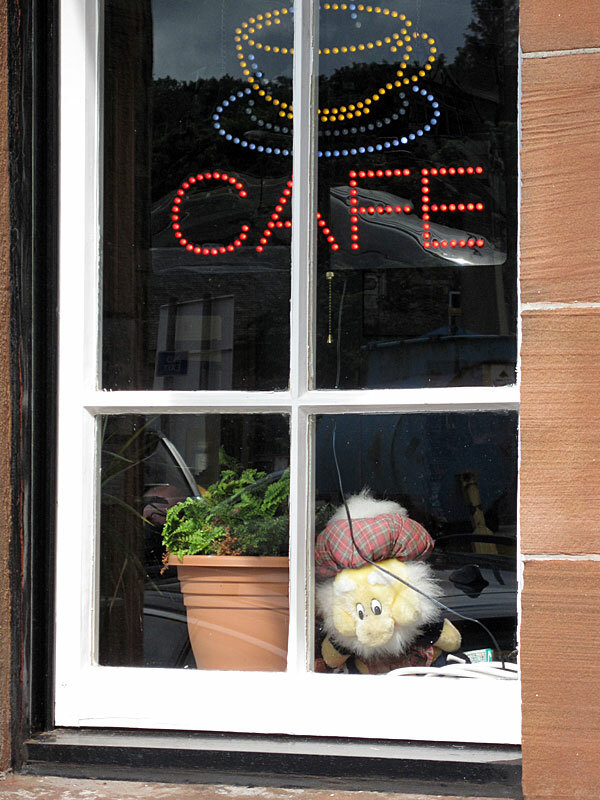 The house was built around 1850 for Charles Wilsone Brown, a property developer who sold the mansion to Sir John Burns (later Baron Inverclyde) in 1860. 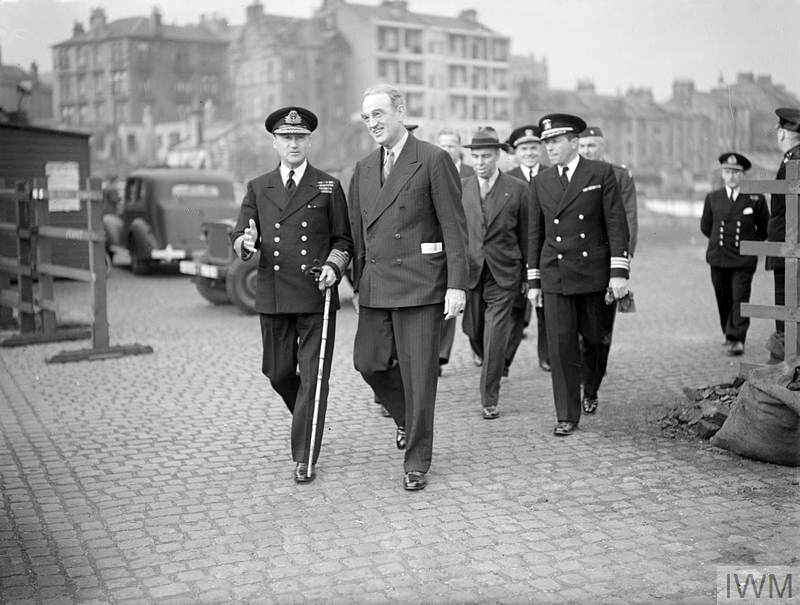 Burns commissioned the architect Robert William Billings to remodel the house in the Scottish baronial style, expanding the original structure by adding a new floor, new wings and a clock tower to the south-east corner. 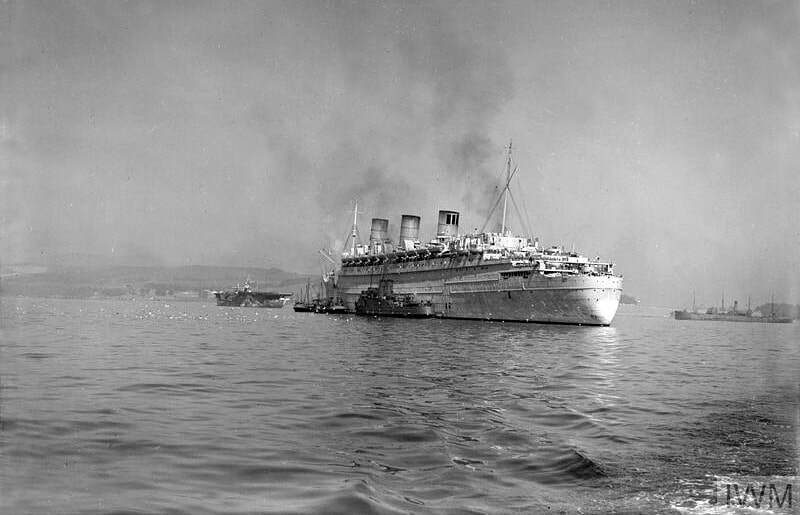 Castle Wemyss became a fashionable destination for many well-known visitors, including Lord Shaftesbury, Anthony Trollope, General Sherman (Commander in Chief of the United States Army), Henry Morton Stanley, Peter II of Yugoslavia, Emperor Haile Selassie and members of the British Royal Family. 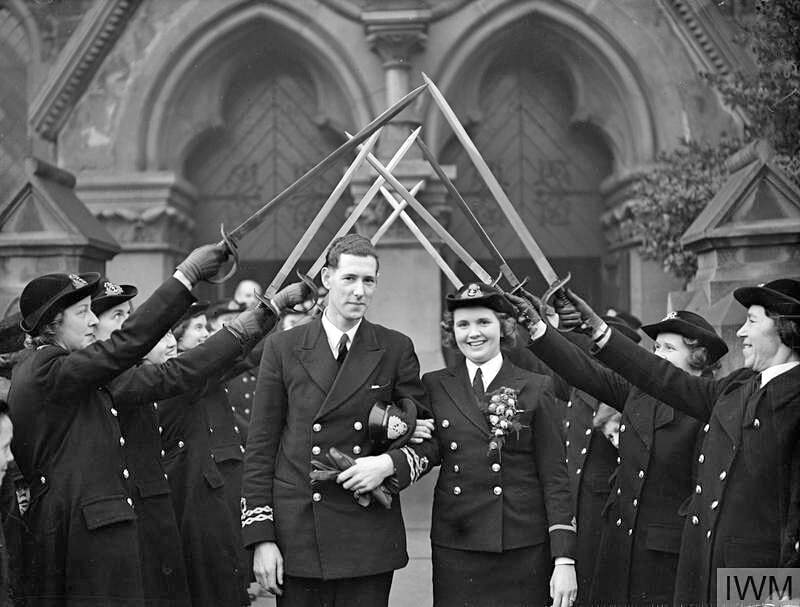 ​This Imperial War Museum image confirms that the mansion was used for military purposes for a time but as yet I have no further information. 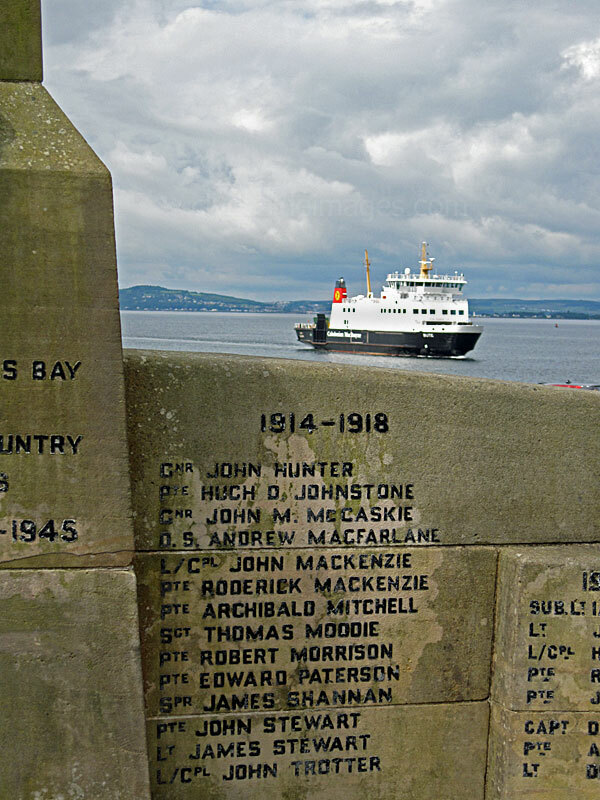 During the Second World War a long stretch of beach at Wemyss Bay was concreted to facilitate training in the loading and unloading of Tank Landing Craft and amphibious vehicles. 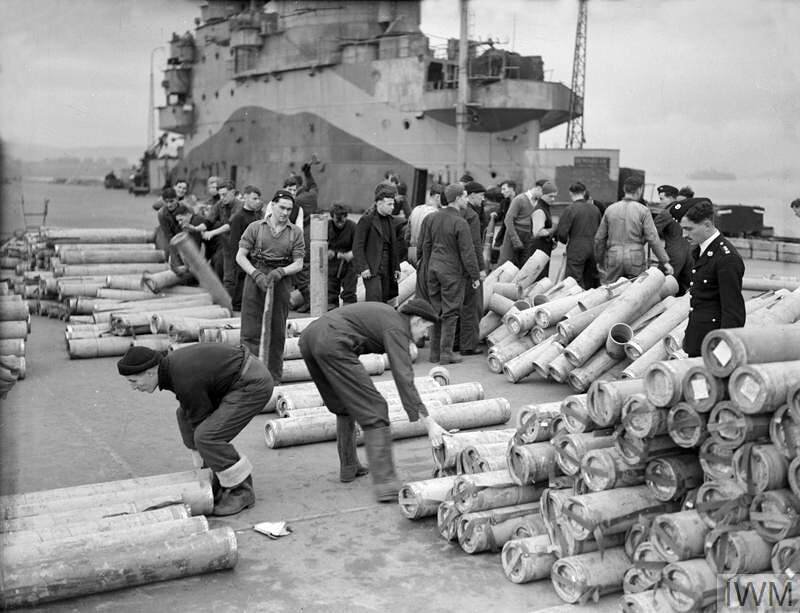 Had the sand not been so protected the soft surface would soon deteriorate and be rendered useless by the repeated passage of heavy tyres and caterpillar tracks. 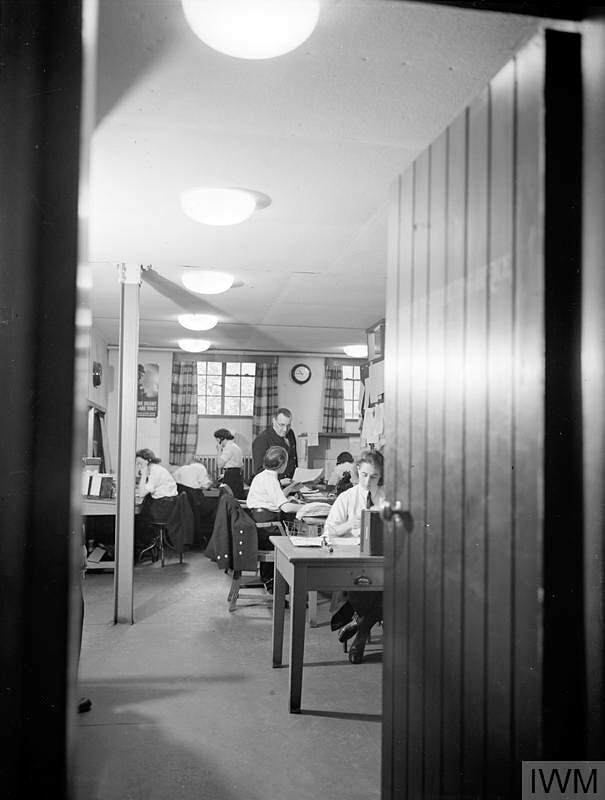 Many other similar training areas were established along the more remote and quieter areas of the Firth of Clyde and its sea lochs with Ettrick Bay on the west coast of Bute being one such location.